Why do WordPress site owners add so many Categories and Tags, it’s such a bad SEO idea! Going through about 30 domains I bought recently all running WordPress and some have more categories and tags than posts!!! It’s ridiculous, I must have deleted over 150 categories from those domains because of over use of WP archiving. Best way to use WordPress is minimal categories/tags, majority of posts go in only one category (I don’t use tags because there’s no difference between a WordPress Tag and a WordPress Category). Don’t do “this post can go in these 36 categories and 58 tags because more is great SEO”!!! 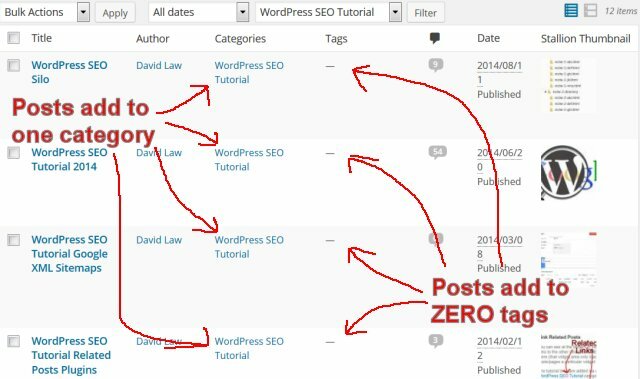 More isn’t always better SEO, below is a screenshot of the WordPress Dashboard “Posts” >> “All Posts” screen for the WordPress SEO Tutorial categories posts only, you can see none of the posts have tags and are only added to one category (that’s all a post needs on archiving terms). 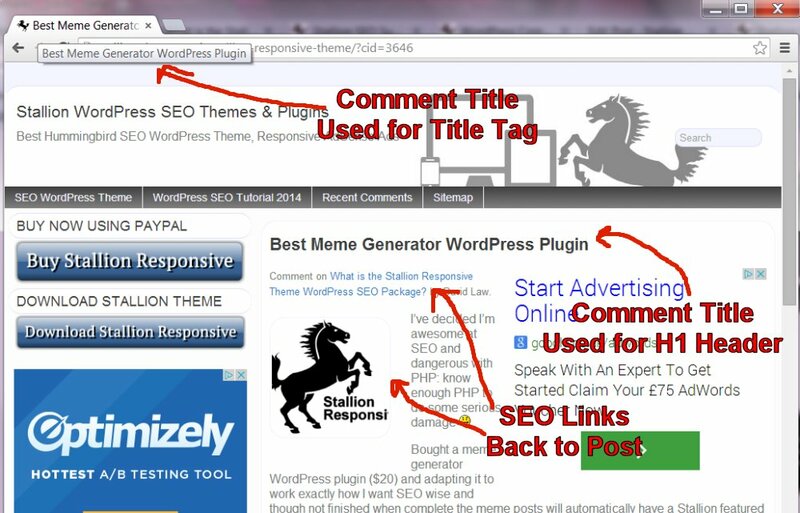 For those who believe silo SEO is important adding your WordPress posts to only one category makes link siloing so much easier, especially when using the Stallion SEO Package which includes silo SEO support. There’s over 200 WordPress posts on this site (and a few static Pages), not one is in two or more categories and there are ZERO tags. Googlebot (Google’s search engine spider) has no problem at all fully spidering and indexing this website and ranking it for relevant search phrases. One WordPress category for each post is more than enough as long as a category doesn’t paginate too deep. To keep the link juice flowing smoothly on relatively small sites try to keep the number of posts in a category to 10 or less so you don’t get Category/Tag page 2, page 3 etc… (this assumes you have kept the number of posts per category to the default 10) because it means the posts archived on category page 2/3 etc… are barely getting any link benefit. For larger websites try to keep to under 20 posts per category, all depends on the number of posts on the entire site and the number of WordPress categories, larger a site more posts you might need to add to a category OR consider more categories with tighter niches (basically as a site grows add more categories to further niche the archives). Adding tighter niches is another way to silo SEO your website. 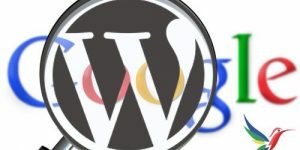 If you stick to these loose WordPress SEO rules there’s very little wasted link benefit and most posts get a fair amount of link benefit and are easily found by Google and your visitors. Try to avoid sites with categories with 3 posts in and other categories with 30 in, the category with 30 in are not getting their fair share of SEO link benefit! Many webmasters believe only backlinks from external domain have SEO value, this isn’t true, webpages can be ranked high in Google only from internal backlinks, but generally speaking easier it is to get to a webpage from the home page (fewest clicks away from home) more internal link benefit that page will receive. Remember every page on a site that’s linked uses link benefit, if a site has 30 posts and 30 categories/tags because the way WordPress links webpages together (priority goes to categories/tags) most of your link benefit never finds it’s way to your articles. 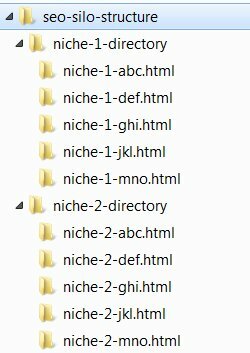 Take a look at selection of your WordPress sites webpages (look at a Post, a category/tag, home page etc…) most will have all the categories linked, all tags linked and if you use monthly archives (PLEASE DON’T, MONTHLY ARCHIVES TOTAL WASTE OF SEO LINK BENEFIT) the latest 12 months linked as well. What you won’t find is a complete list of all your posts (unless it’s a small site), you might have the 10 recent articles, 10 popular articles, 10 recent comments. If you have a site with 300 posts and 50 categories/tags (you haven’t followed my earlier SEO advice on limiting categorizes) you might only have the recent 10 posts linked from the home page, but you will have all 50 categories/tags and the monthly archives (62 archive links sitewide). This will allow search engine spiders multiple routes to your content, but at an SEO cost, the archive sections of your site will gain more link benefit than the actual posts! Before your important content (posts) get their link benefit your over use of categories and tags has wasted over half of it! How to mitigate the SEO damage. By following my earlier advice and cut categories/tags back to minimum, delete the monthly archives widget completely (calendar widget is even worse, ditch it) you could reduce the categories/tags to 20 to 25 archives so we only have 20-25 category links sitewide rather than 62. Still 25 sitewide category links is a lot of links and not only does this cost a lot of link benefit, it’s damaging any Silo SEO linking Structure you might be working on. By using the Stallion Responsive WordPress SEO Package you can further limit the amount of link benefit your categories consume. If you look on this sites home page just above the footer you will find a categories widget with less than 20 categories. Look at the same footer area on this post you are on now, no categories widget! Stallion Responsive includes a display widget feature you can use to set which parts of a website a widget should be shown on. For this site I have the categories set to display on the home page, all categories (all archive sections of the site) and search results, but not on Posts or Static Pages (or Stallion SEO Super Comments Pages: another Stallion feature that generates pages from comments). This means the category widgets links are only loaded on around 30 pages of the site. Individual categories are still linked from within Posts (see where the article date is: this is a good silo SEO link, it’s related to the content), so categories are still well linked, but no where near as much as if I didn’t use the display widget feature. For example if a category has 12 posts within it, the category will have a further 12 links from those 12 posts, so the category would have around 42 internal links. More posts within a category, more internal links it will have. Since this site is well commented and I use the Stallion SEO Super Comments feature and the SEO Super Comments link back to the post the comment is on, you will find the posts with a lot of comments have significantly more internal links than the category the post is in. It sounds strange for me that all my categories are hidden or deleted. I have created but now it disappeared. What’s the problem? I hope that you can guide me more about this. Oh, did you finish your update? I really want to see it. I took a look at your site and not sure what the issue is, only thing I noticed was your articles on the home page are all added to the Uncategorised category and the links are missing (the Uncategorised word should be linked). Only time I’ve seen something like this (not seen that before, but seen similar) is when part of a database has crashed. Check your MySQL databases is running correctly, if not fix it. You’d use this when logged into your control panel or similar where you can enter SQL queries (I have no idea how for your site). The above will repair the table wp_posts if that’s the table that’s crashed, if wp_term_taxonomy crashed repair it. Also try disabling all plugins, see if it helps. I’m reasonably confident this won’t be a Stallion issue. You can confirm this by activating the TwentyEleven theme and see if the issue remains, if it does it’s not Stallion. Still working on the update, will be announced on the mailing list when complete. I don’t see as that does much good. Regarding to my Categories, I have created many for my originals but it was deleted or hidden and all posts go to Uncategorise. It is so strange. I never use MySQL and I don’t know whether I can do it or not. Bring up your privacy page up into your editor in wordpress. Below the editor are places for custom fields. Go just below that and you will find a check box for comments. Uncheck it and save your privacy page and no more comments. Hi Dave, not sure if this fits better here in the categories/tags section, or on the SEO Silo tutorial, but I had four questions related to using categories and how that might fit into a silo strategy. I’ll put the link to that article below for anyone who wants it as a reference, I found it very helpful in explaining the silo concept and how to achieve it pretty easily using the Stallion SEO Posts widget. I know we’ve discussed categories (and tags) in the past but just wanted to get your thoughts with the concept of siloing links in mind. 1) Is there an ideal number of categories, or if not, a max number of categories you’d try not to exceed? I have about 1400 posts which would be categorizable (rest are pages) and trying to look how to best do that, keeping in mind your use of categories to silo links via the Stallion SEO Posts widget. 2) Which page or pages should display the category widget? Does having it on just the home page suffice? I know we’ve discussed using category links as a way to make sure Google spiders content across your site (previously I had it displayed on every page of the site). If the categories widget is just on the home page, will that suffice to let Google and other spiders crawl content across the site? 3) Related to #3, is there a lot of value in having clickable Category links switched on for each post in the meta date area (ie, the little links which appear next to the date)? I know you have it as a “suggested setting” in Stallion Responsive Layout Options. Is this mainly recommended to strengthen the category pages, or is there another reason? 4) Do you have any recommendation on what to do with tags? I have a lot of old tag pages (over 80 total! ), some get search traffic in their own right, however they don’t lend themselves to easy sorting/siloing via the Stallion SEO Posts widget like categories do. Plus, 80 just seems like way way too many to me. I also know you don’t use tags at all and don’t recommend them, but just wondering if you had any advice for users who have been using tags, as to what to do with them moving forward? Thinking of converting the best tags to categories, and then using the categories in a silo structure. But not sure if it isn’t better to just create a new category with the same name as the tag. Thanks for any thoughts you have, maybe it is better to split this up into different replies, feel free to do so if you feel that is useful. Some really good questions regarding category SEO, unfortunately there’s no simple no more than X categories answer, depends on the site and how much effort you are willing to put it. Since we had our earlier discussions regarding tags and categories Stallion Responsive has improved regarding Category SEO. Go to “Posts” >> “Edit Categories” and edit one of your current categories and you’ll find the “Google Panda Buster Settings”. SEO Category/Tag Description : Adds some content at the top of the category. The 4 keyphrases and the Category Name is used when a category has enough posts to be paginated. My Responsive tutorial series is the best example on this site because it includes 38 posts. Most of my categories have under 20 posts each. Currently doing some category SEO testing and have decreased the number of articles on a category page from the default 10 to 5 “Settings” >> “Reading” : “Blog pages show at most” = “5” (not suggesting others try this). Made this change so more categories break into multiple paginated pages, a category with 20 posts will paginate over 4 pages with the “Blog pages show at most” set to 5. So made this change so I can SEO test the feature better. If you go to the Responsive Tutorial category and browse through the paginated archives you’ll find the title tags change, they use the Google Panda Buster Keyphrases. 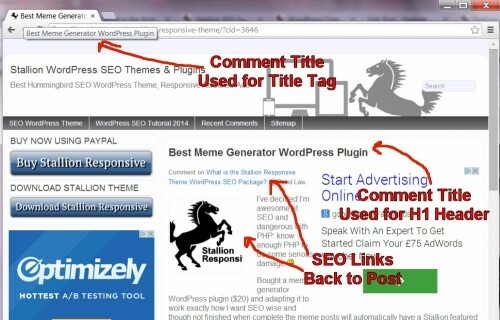 This is the same SEO feature you see with WordPress posts that have enough comments to paginate, Stallion uses the keyphrases from the posts for the title tags. With paginated posts (posts with lots of comments) I’m seeing SERPs from the paginated comment pages, they aren’t as easy to rank as the main post (page 2 won’t have many internal links), but they do rank. I expect the same results with paginated categories where the keyphrases are set. If we average 25 posts per category and use the settings above we can maximise potential SERPs from category archives. If we average 50 posts per category and set “Blog pages show at most” to “10” again we can maximise potential SERPs. I’ve always advised to try to minimize how deep a category paginates because the posts on page 2+ of a category aren’t going to get a great deal of link benefit from the category archive links. So we have two competing SEO concepts. Keep the category pagination to as few pages as possible to maximise link benefit flowing to posts and paginate up to page 5 of a category to maximise potential category SERPs. One of the reasons I’m doing an SEO category test, to see what happens. I’m still tending towards keeping paginated categories to a minimum (link benefit flow is very important), but if you can’t create enough categories to mimimize pagination at least the first 5 paginated categories can gain SERPs in their own right. With a small site where there tends to be no or few paginated category pages you can see the above SEO category feature doesn’t add much to a site. For a large site where you have no choice but to add dozens of posts in a category, could add new traffic. I would try to avoid categories with 50+ posts, based on this with 1,400 posts you’d be looking at around 30 categories. How to silo the categories links depends a lot on what they are called. Your current 14 categories are tightly niches around the keyword Amish, only two lack the word Amish. If the entire site are pretty much targeting Amish SERPs there is the argument the category links help the vast majority of your 1,400 posts. Read what I wrote about why I don’t have a sitewide categories widget on this site on the SEO silo article. The anchor text of the categories link cause SEO damage to each distinct set of niches targeted under this domain. I don’t want a link to a category with anchor text “Product Reviews” on posts about “WordPress SEO Themes”, different niches. If all your niches are related to Amish, you can see a category link with anchor text “Amish Food” helps your posts about “Amish Furniture”. So for you there is the argument for a sitewide category widget, but if you follow my advice about adding more categories you’ll have them all sitewide. On this site because the category widget does have a variety of anchor text (different niches) I’ve used the display widget options to not load it on posts, this means for this site the anchor text on individual posts tend to be better targets to that page. You should look at some of your posts and see what the anchor text (all of it) says about each webpage, does it generally support your posts? Will posts be better/worse optimized if you remove the category links anchor text? If you find you would have better optimized anchor text for each post if the category widget wasn’t loaded on posts, do what I’ve done and load the category widget on archives, home page and whatever pages makes sense. When I’ve looked at posts at amishamerica.com some aren’t optimized very well when I look at the title tags. They aren’t targeting Amish SERPs, in isolation you wouldn’t know “Building a New School (9 Photos)” is really about “Building a New Amish School Photos”. You might find because of posts like these the category links which do include the Amish keywords helps these poorly SEO’d posts, adds relevance. I would keep the category link in the meta date area, it should be relevant to the post and adds a link to the category. On tags I’d convert the ones with traffic to categories and delete any with no traffic, but manually 301 redirect them to the most relevant webpage on the site. If this was my site I’d probably work on breaking the content over around 50 categories (about 30 posts a category: I’d aim for between 20 and 50 posts per category). if you don’t mind extra work you could drop the categories widget and manually build multiple custom Text widgets with links to sets of categories. Let’s say you have 50 categories and you could break the 50 roughly into a few niches: (making these up) Amish geographical locations, Amish jobs/work sort of stuff, Amish products, Amish beliefs… I’m sure you get the idea. You could build manual links (in a text widget) that only links to a particular set of categories, you might have 15 categories for the location set, so you would have a text widget with only those 15 category links. You could then use the widget display feature to load the text widget only on the 15 location categories. This would better silo SEO your category links, it would be up to you if you also loaded the location categories text widget on the individual posts within those categories. It’s more work, but would mean you could add 100 categories and not have 100 category links one every page of the site. Would make for a nice silo SEO feature to have a category widget which you can select which categories to load via tick boxes rather than making manual text widgets. How many posts in each Wordpress category? Thanks Dave, great answer, some nice ideas here that helped me think through what to do with my categories. I like the idea of just creating a widget with links to some of the categories and using it selectively, so you don’t have 40-50 categories anytime you use the category widget. Makes sense (and I do agree a feature where you could selectively choose which categories to display via the category widget might be handy). 30 categories might be ideal for me; I know that in the SEO Silo Tutorial you suggest displaying more than 25 links is getting to be a lot in terms of the number of posts you show on that page. I guess I could do this and limit it to just show the first 25 in cases where I have a category with more than 25 posts. I also considered for now making around 30 categories, but with one or two of them being larger than the others to contain the lower value posts (ie less content/less well-optimized) and having more posts in those 1 or 2 “holding” categories than the others (up to 100? ), at least until I decide what to do with those posts. This may not be the optimum solution, but since I keep creating new posts, and every post needs a category, need to figure out what to do with all the posts. Maybe simply keep creating new categories for each 25-50 posts, would probably be 3-5 new categories/year at my writing pace. I think your test decreasing from 10 to 5 per category page is interesting. I had wondered about this in the past. It seems like 10 is the default or standard number of posts per archive page on a lot of sites, but maybe there is an advantage to having fewer per page. I’ll be curious what you learn from that test. How closely should keywords be related? I had another thought while reading your reply, I don’t know that there is an answer so no need to reply, but for what it’s worth…you suggest that Amish Food is related to Amish Furniture, which it definitely is, but I wonder if it is related closely enough? For example, I have categories for Amish Shops, Amish Woodworking, and Amish Business, which are arguably all more closely related to Amish Furniture. I guess it’s a matter of how focused a page needs to be, and also maybe you can overdo it. And I know as you said there is a balance between being user-friendly and natural and optimizing around keywords and niches. As you say with 50 categories you wouldn’t want a sitewide widget (I realize I wrote 30 in my reply above but may end up closer to 50 as you suggest); maybe I would simply “batch” categories in related groupings, and use them on appropriately related pages. Depends how niched you want your silos and how much time you have to build your silo architecture. That would severely limit what I could link to and to achieve this would mean I can’t have a popular posts widget, recent posts widget, categories widget or navigation menu, ALL links would be added manually. A website silo architecture to this degree is impractical to say the least AND would make navigating the website almost impossible and cause SEO damage to the site overall in an attempt to think SEO only about one webpage at a time! With a large site look to break into a distinct set of niches (silos) and try to limit internal linking mostly (not exclusively) to within each silo. The difficulty is with a site that is pretty much one niche already, can you build distinct silos and should you? If you had a huge site that included what you have now (Amish information), plus three more distinct niches: let’s say Forest Management, Antique Farm Equipment and Real Estate with each having over 1,000 posts each. You can see it would make sense to have a separate SEO silo for each of the four main niches and maybe sub-silos under each main silo. There would be some overlap, Amish farm equipment, Amish real estate… so there would be some obvious places to link silos together on a page by page basis and/or a category by category basis. What you have now is one main niche (Amish) and it’s up to you how much you want to break that main niche into smaller niches (sub-silos) and that depends on how much time you want to devote to building your silo SEO architecture and what you consider a niche/sub-niche. Right now I have 19 categories and under 250 posts. As I add more content I’ll create more categories. Right now having 19 links to all categories from all categories, the homepage and a few other pages works. The categories widget isn’t linked from any WordPress posts (which includes the SEO Super Comments as well). This means the category widget is loaded on probably 100 webpages (home page, all categories and some pages) and the 250 post and the thousands of SEO super comments don’t load any unrelated category anchor text. It’s your actual posts where the silo SEO is most important, by not loading the categories widget on WordPress posts (at least 1,400 pages for your site) you leave the anchor text optimization down to what you add to the content of a post (I try to add contextual links from all posts related to the post) and any popular/recent posts widgets which can be siloed to each category or a set of categories. If I get to 1,000 posts I might have them shared over 50 categories. I won’t know how to exactly silo SEO the website until I get there, depends on what the categories are and how many posts in each. Might make sense to build the custom category widgets I mentioned, I could see a category widget of only SEO categories, another with money categories, beyond that we’ll see. If I can tightly niche the category widgets to maybe 10-15 highly related categories per widget, might make sense to load those widgets on posts as well. 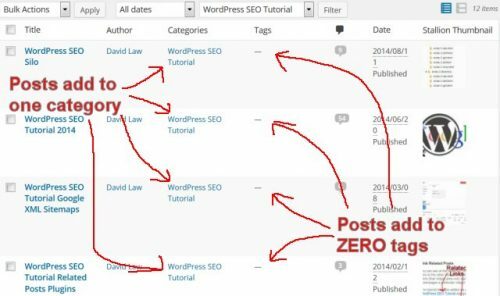 This post is in the “WordPress SEO Tutorials” category, would make sense to load a category widget which linked to categories about WordPress, SEO and Tutorials. Convert WP Pages to Posts? Thank you Dave, didn’t expect such an extensive reply, but this definitely helps. Well noted on overdoing things; I don’t want to take things to an extreme but am leaning towards the custom category widget as you suggest. There are a few topic groups which segments of categories could fit within. I am also wondering how to treat my pages – in addition to the 1400+ posts, have around 500 pages. I didn’t originally publish these as posts as a lot of theme were reference-type content and published in bulk, so didn’t want to bombard blog subscribers. It is actually some of my best content though, in terms of traffic and how extensive it is. Am thinking it may make sense to convert them to posts (since as I understand in WordPress categories are for posts only) to allow them to be used within the SEO Posts widget (unless that would be harmful to the converted pages in some way). That would then give the ability to incorporate some of these into a Silo structure as well and use them with the Stallion SEO Posts widget. I’ve moved away from WordPress Static Pages because they aren’t automatically linked from categories and aren’t added to popular post widgets etc… as you mentioned. If your permalinks settings use this custom format /%postname%/ (Looks like yours does) you can switch WordPress Pages to WordPress Posts with no need to setup any 301 redirects. It still has that URL after changing to a Post. If you did have a permalinks settings with say the date or a category name it would require some 301 redirects to pass SEO benefit. Looks like all you’d have to do is switch Pages to Posts and set a category, easy to do. I use the WordPress Post Type Switcher Plugin https://wordpress.org/plugins/post-type-switcher/ for switching. Never had to switch hundreds at a time mind you, I’ve switched handfuls of Pages to Posts at a time which doesn’t take long. I’d probably do them in batches starting with the ones with most traffic so they get the links from your widgets and category archives and as you’ve not set the Stallion keyphrases set some of them as well.